A birth print like no other you’ve ever seen, Schmooks create birth print artistry that is truly beautiful, beyond what you could ever imagine! What I wouldn’t give to be able to magically peek inside Canberra-based artist Claire Cimbora’s imagination. The talent behind the Schmooks brand, Claire creates the most enchanting and ethereal collage-like illustrations I’ve maybe ever seen. 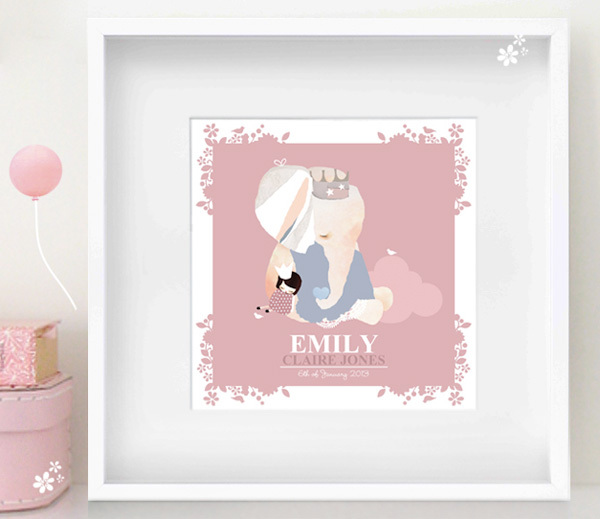 You can have one of these dreamworthy creations hanging proudly in your little cherub’s nursery by way of a gorgeous keepsake – a personalised birth print. Schmooks personalised birth print measures approximately twenty centimetres square and are available in several designs and are completely customisable and you can proudly display your child’s full name and date of birth for all to see. You can even make a delightful wall art duo by pairing a birth print with a equally charming Schmooks print. Personalised birth prints are priced $27.62 and available at Schmooks‘ Etsy store.